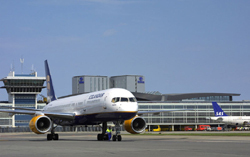 Founded in 1925, Copenhagen Airport was one of the first civil airports in the world. The early years were characterised by the pioneering spirit in a day and age when flying was for the privileged few. The airport was an attraction in itself, also for the many people who did not have the opportunity to fly. A Sunday outing to the grass field in Kastrup, from where the large birds took off, soon became an attraction extraordinaire for the Copenhageners. In 1939, when flying was really gaining momentum and construction of Vilhelm Lauritzen’s new air terminal was completed, World War II broke out and temporarily stopped the growth of the airport. But when the war ended in 1945, Copenhagen Airport was ready for tremendous growth, and things have developed quickly since then. From 6,000 take-offs and landings in 1932 to almost 259,000 in 2003. Click on the menu to the left and read more about the airport’s exciting history and growth. Driving Directions: From Copenhagen, the airport can be accessed from the E20 highway. The Kystvejen coastal road, running around the airport, connects to the Øeresund motorway at Dragør. The Øeresund Bridge is a toll bridge that connects Sweden and Denmark and is the main route to the airport from destinations in Sweden. Car Parking: The airport has some 6,800 spaces in short-, medium- and long-term parking lots. P1 is an economic alternative for passengers using Terminals 2 or 3, whilst P2 gives good access to Terminal 1, P4 is a multi-storey car park for Terminal 2, and P6, P7 and P8 are close to Terminal 3. P10 is an economy car park located further away from the terminals. Parking is free in all car parks for up to 15 minutes. The airport parking office is located in Terminal 3 and is open 24 hours (tel: (0)3252 8300). Rail: There are direct high-speed trains to Copenhagen Central Station (journey time: 12 minutes), as well as a number of other destinations in Denmark and Sweden. The train station is situated in Terminal 3. Road: Taxi: Taxis are readily available from ranks outside the Arrivals area of Terminals 1 and 3. Bus: Several buses, include bus nos.30, 250S and 500S, run from the airport to the city centre and beyond. Night bus no.96N runs from Terminal 3 to Rådhuspladsen. Other services include bus no.888 to Århus. For more information visit Trafikinfo (). Information and Help Desks: Information desks (tel: (0)3231 2448) are located in the Arrivals and transit halls in Terminals 2 and 3, and there is a visitor centre in Terminal 3. Money and communications: Banks are located in Terminal 2. There are bureaux de change in Terminals 2 and 3, and ATMs in all terminals. A post office is situated between Terminals 2 and 3. Wireless Internet is available at many points in the terminals and a number of self-service Internet kiosks can be found in the transit areas of Terminals 2 and 3. Eating and drinking: There are plenty of restaurants, bars and cafés at the airport. Shopping: Shopping is plentiful, with many duty-free shops. A pre-order and pick-up service is available (). Luggage: A left-luggage facility is available between Terminals 2 and 3, and there are also self-service lockers. Other facilities: There are shower and sauna facilities at the Transfer Hotel. Play areas for children are situated in Terminals 2 and 3; most toilets are equipped with baby change facilities. A 24-hour prayer room and a free rest area are located in Terminal 2. Conference and Business Facilities: The Hilton Business Centre (tel: (0)3244 5208; ) is located in Terminal 3 and has 14 executive conference rooms, a VIP room, a conference room accommodating up to 50 delegates, and nine meeting rooms. 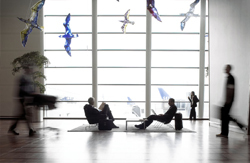 Various airlines and handling agents also provide business facilities in their executive lounges in Terminals 2 and 3. Disabled Facilities: The airport is physically accessible throughout and wheelchair-accessible toilets are provided. Passengers with disabilities are requested to inform their airline in advance of their needs. Disabled parking spaces are available too. Induction loops are fitted in the transit halls and reserved seating is available.